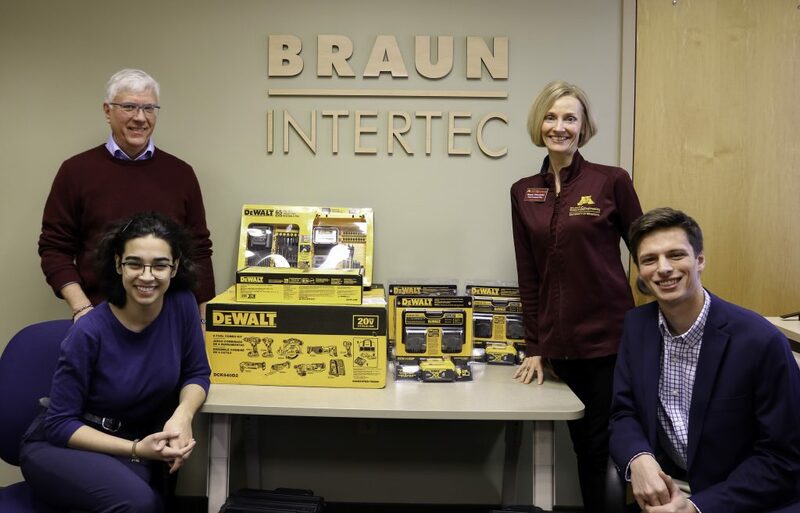 Braun Intertec recently donated some much needed tools to the Engineers Without Borders USA University of Minnesota Twin Cities Chapter (EWB-USA UMN). Engineers Without Borders is a non-profit organization that partners with communities around the world to improve their quality of life through engineering projects that prove to be environmentally and economically sustainable. During 2018, the EWB-USA UMN team traveled to the Highlands of Guatemala to begin working on a project that will provide water to households in the area by digging a 560 foot well to reach the water table. Early on the team recognized their current tools were not ideal for their project plans, which includes a return to Guatemala this spring to install two miles of PVC pipeline in order to connect the homes to the water supply, while another team plans to travel to Ethiopia and work on a drip irrigation system. That’s where Braun Intertec came in. As one of the corporate sponsors for the University of Minnesota chapter, the Braun Intertec Foundation donated various power tools the chapter needed. These tools will help the team to complete the Guatemala water project, assist with the water implementation in Ethiopia and aid future project designs. We are proud to support the students and their mentors who contribute to these amazing projects and have a passion for helping others around the world. The Braun Intertec Foundation supports environmental advocacy, STEM education as well as health and human services in the communities we serve. For more information about our charitable giving and community involvement, click here.